In previous editions, we have covered anti-Semitic cartoonists, terrorist leaders and hate preachers. So it was with some abhorrence, but little surprise, that today [July 25] I read a piece by the Guardian (and former Telegraph) columnist Peter Oborne, with Abdul Wahid, the British leader of Hizb-ut-Tahrir, an awful proto-extremist organisation with typical apologia for the usual Islamist terrorists. Oborne is so consistently wrong with almost everything that he writes, of course, he generally provides a useful service to readers of what not to think. But even for him, this was pretty dire. 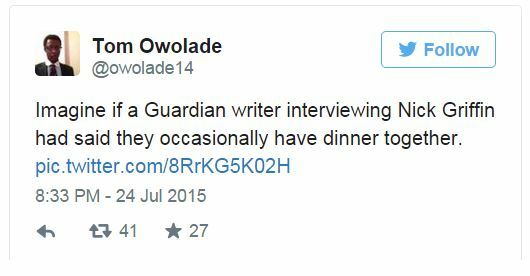 It is not so much the fact that he interviewed him – journalists should, of course, interview all sorts of people, including unpleasant ones – it is more the tone of the narrative which tries to strikes a weaselly balance between saying “of course, I don’t agree with him” and “but he’s so misunderstood”. In particular, Oborne tries to dress up the suggestion that Cameron or others might want to ban his organisation as a free speech issue. But it is a straw man: no-one is saying that Wahid’s personal speech should be curtailed as an individual. The debate is about whether he is allowed to run an organisation, raise money and so on, in a way which multiplies the power of his and other similar voices in a way that might influence others, ultimately, to violence. There is a huge difference. Wahid, with his oh-so-plausible bedside manner (he is a respectable doctor in his day job), goes on smoothly to defend all the usual regressive tenets of Islamist oppression such as separating men and women; he refuses to denounce an anti-Semitic pamphlet; when confronted with challenges on attitudes to democracy and sexism, he resorts to whataboutery (“ah, yes, but what about this country?”); and so on. But the reality of his organisation is worse. It may not be as directly murderous as ISIS, but he still talks calmly about his desire to build a theocratic, totalitarian caliphate. It is an entryist organisation, too, looking to get its people in influential places towards that end. You can find more about its general unpleasantness at a selection of Harry’s Place links here, including its charming “purify the earth of Jewish filth” press release. Ah, but racist extremism can only exist on the far right, can’t it? UPDATE 25 JUL: Thanks to Tom Holland for pointing out the draft constitution for the Caliphate, which includes such things as execution for apostasy (article 7c) and, er, legalised slavery (article 19). I don’t understand what this line is in reference to. Anybody extremely religious can not possibly be left wing. The two are diametrically opposed. Possibly both Mohandas K. Gandhi and Martin Buber transcended the right-left paradigm? On the other hand, Dorothy Day and the Catholic Worker movement, as well as others with a religiously inspired sense of social and economic justice as the heart and soul of human progress and connecting that awareness to something experienced as `Divine,’ might qualify as on the left. 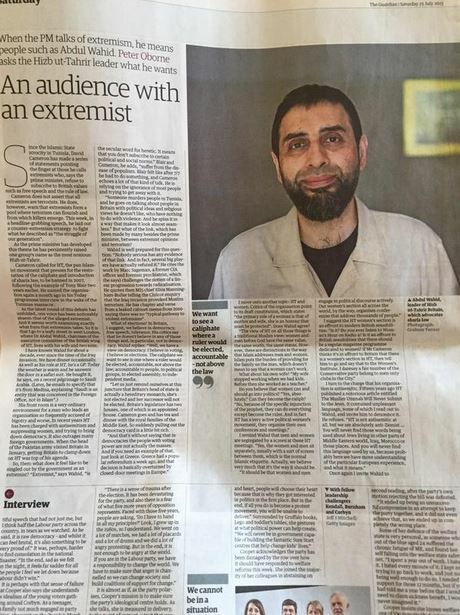 Guardian provides head of antisemitic, pro-caliphate group full page to ‘explain’ his ideas. This is natural. Fascism/totalitarianism lovers remain Fascism/totalitarianism lovers even if they call themselves the “world leading liberal voice”. This is cutting edge stuff. Anthropologists please take note.